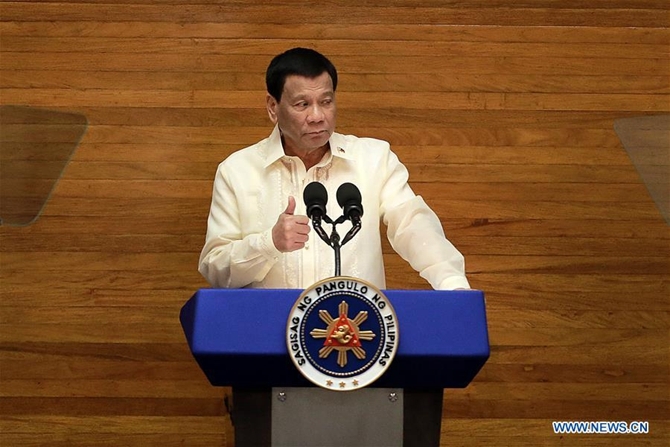 Philippine President Rodrigo Duterte vowed on Monday to intensify his administration's war on illegal drugs, saying the fight against drug dealers and users is "far from over." The president said in his third State of the Nation Address that the war against illegal drugs "will not be sidelined," and promised the campaign "will be as relentless and chilling." "These drug dealers know fully well that their business is against the law. They know the consequences of their criminal acts, especially when caught in flagrante delicto and they violently resist arrest. They know that illegal drugs waste away lives, destroy families, and ruin relationships," Duterte added. Duterte launched the anti-drug crackdown after he took office in June 2016 to wipe out the drug trade in the country. Data from the Philippine government showed that 4,354 suspects have died in the Duterte administration's war on drugs compared to 147,802 that have been arrested in 102,630 anti-drug operations conducted from July 1, 2016 to June 30, 2018. And to his critics, Duterte said he would not be dissuaded from continuing his war on drugs. During the less than one-hour speech, Duterte also vowed to combat corruption. "Corruption is like a leech that it bleeds the government of funds programmed for its infrastructure and other social development projects. It saps the morale or the morale of dedicated and honest government workers," he said.